In the Blu-ray extra “Breaking the Golden Rule,” Emmy award-winning Friends star Jennifer Aniston makes the astute observation that she assumed Marley & Me “was a dog movie,” until it ripped her heart out. 20th Century Fox’s film—released on 2008’s Christmas day —was based upon newspaper columnist John Grogan's 2005 best-selling nonfiction work published under the same name which consisted of the affable Grogan’s humorous and heartfelt anecdotes about life, marriage, family, and work when living with what he jokes is “the world's worst dog." The work earned the same type of Oprah-friendly like following as a sort of Tuesdays with Morrie book for the dog lover in all of us. And to those familiar with the material, the idea of releasing it on a family-friendly holiday seemed like a curious choice. And while-- given its PG rating and suitability to play for families as it’s minus the raunchy humor found in some of its star Owen Wilson’s earlier collaborations in the frat pack comedies with Vince Vaughn such as Wedding Crashers-- the ending of Marley started to earn comparisons to Bambi, Old Yeller, and the like even before its release. This was especially evident as several movie webmasters (including myself) were sent spoiler warnings and photos of what was said to be L.A. graffiti that used three, one-syllable words to reveal the fate of the character Marley in an attempt to deter parents from bringing their little ones to a movie they feared would have the kids crying harder than they might if they’d been told “No, Virginia, there isn’t a Santa Claus” or had shot their eye out with A Christmas Story’s Red Rider BB gun. I didn't post the spoilers since I dislike them on principle but I also couldn’t verify the accuracy nor what the intention was of the first individual sending them my way in the first place. Moreover, I truly feel that ultimately it’s the best mode of film study to try and avoid pre-judging a work (no matter how bad some of them look such as The Love Guru or Dance Flick), but having just seen Marley & Me recently in this gorgeous Fox Blu-ray transfer, I can definitely admit that much like Jennifer Aniston noted, it rips your heart out indeed. Likewise, it seems perhaps best suited to early teens and adults than the teaser trailer of the beautiful lead actors chasing their yellow Labrador retriever down a sandy beach implied. Simply put, Marley & Me isn’t Million Dollar Baby but it also isn’t Beethoven, Turner and Hooch, or one in the long line of the many silly comedies about man’s best friend. Working from a script by the best author of Elmore Leonard adaptations currently working in Hollywood-- Mr. Scott Frank (Out of Sight, Get Shorty) -- who also collaborated with the talented Don Roos (Boys on the Side, Bounce), Devil Wears Prada director David Frankel takes a more sincere and authentic approach to dog ownership and the irreplaceable bond that forms between pets and their owners. It seems as though it's no accident and indeed foreshadows the rest of the film that upon trading the blizzards of their Michigan home for the sunshine and promise of Miami, Florida—newlyweds John and Jenny Grogan decide that the first logical step before bringing a child into their home would be test-driving their nurturing skills on a new puppy. Or at least that's what John Grogan decides after realizing that he's not quite ready to become a father just yet, struggling to fight the delusions of Woodward and Bernstein like hard-hitting newspaperman grandeur he dreams of that’s personified by his talented, fearless, toxic bachelor college friend and colleague Sebastian Tunney (Eric Dane). He's even more conflicted when his new editor Arnie Klein (Little Miss Sunshine’s Alan Arkin) surmises that John’s writing style is perhaps best suited to becoming a columnist. Perhaps one of the only newspaper staff writers working in what’s now becoming a scarce dinosaur-like industry who hesitates to accept a truly permanent gig at double his salary, John eventually reconsiders, realizing that he has the ultimate source for writing inspiration when the creative well runs dry upon bringing the adorable, charismatic “bad boy” puppy Marley into their home. Initially dubbed the “clearance puppy” after John and Jenny are presented with an offer to purchase their new pet for the bargain price of two hundred dollars that would make pretty much everyone else have second thoughts given the adageof “you get what you pay for,” but amazingly the two journalists abandon their professional instinct to ask questions and just say yes. Surprising Jenny with Marley when she returns from an assignment, it was John's hope to have formed an instantaneous bond with the new pup as well as get started on training the smiley pet named after what John perceives to be a preference for singer Bob Marley jammin’ on the radio. However, we soon realize that it’s Marley who’s the one easily running the whole show. In a series of sitcom-like misadventures that fill a majority of the film's running time, we follow the unbelievably devoted patient John and Jenny as they struggle to deal with their four legged alpha-male Marley who gets kicked out of obedience school, chews anything he can get into his eager mouth creating quite a ridiculously expensive amount of damage to pretty much everything with which he comes into contact. Yet, of course, the Grogans decided to put up with the devil inside that angel faced dog even after three small children are added into the equation who luckily Marley doesn’t attack on site. However, it dwells far too much on just how wild the unruly dog is to earn our sympathy. And the filmmakers’ constant decision to tell us how important Marley is to the Grogans rather than show us—which is especially apparent in a great speech Wilson delivers near the end when he lists the times Marley was there for all of them which would’ve helped win us over-- makes the devastatingly sad conclusion seem a bit too manipulative and seemingly Nicholas Sparks-like. Similarly, over the course of two hours in this extremely truncated version of the book, we follow the Grogan family through the inevitable joys and tragedies that befall them including a pretty major strain on their marriage that the film hints could’ve been postpartum depression, however it’s abandoned in the narrative shortly thereafter in just one of many threads that are included as pivotal plot points and then dropped to move onto the next episodic event. Additionally, I was startled to realize that I never quite felt that invested in any of the children characters whom we barely get to know except for trying to use them for the maximum tissue potential in the tear inducing finale. When you couple this with too much time spent on what I assume the filmmakers were hoping would have been the giggle inducing and crowd pleasing, zany antics of Marley it adds up to chaos as-- to viewers-- the untrained and destructive Marley just seems to add fuel to the fire of an increasingly tense relationship between the husband and wife. In fact, in this regard as we see John and Jenny nearly reach a breaking point, the film will definitely strike a chord in those over thirty dealing with the same issues as well. It's one of the film's major relatable through-lines to focus on John's restlessness and envy for more professionally as he sits in his driveway for a few moments too long at the end of each workday before going into the chaos of the household as Jenny—the incredibly talented writer who gave up working to care for the kids—tries to keep her head above water. Although in some cases, watching John and Jenny fight may hit a little too close to home as most couples dealing with far too little time together and quality time being far more scarce as they multitask with dogs and children and careers may realize that instead of endearing us to Marley as was done in print-- onscreen, you’re wondering if they should’ve tried a few more stabs at obedience school. Of course, by squeezing in as many years as the book chronicled into just 115 minutes, Frankel, Roos, and Scott do make you appreciate the film’s lukewarm success in its ability to tell a story that goes far beyond Marley’s tale (or “tail”). And while the tearjerker ending is handled with care, despite a couple of moments that feel forced as suddenly we’re supposed to feel a major bond and understanding with the children whom we’d rarely seen previously, overall it felt as rushed and emotionally chaotic as one frenzied dash by Marley through the Grogan’s home, trying to do as much as possible in as little time in this watchable but ultimately forgettable chase. The Blu-ray transfer of the film is top-notch as Fox again proves their mastery of the format with great picture and sound balance even with an HDMI plug-in and without a full home theatre setup and moreover, for fans of the film, the Blu-ray is the best version to purchase regardless of your technological needs as this marks Fox’s first foray into the popular three-disc format (that I first saw with Walt Disney Studios) by offering the film on DVD, Blu-ray and also as a digital copy file compatible with both Windows Media and iTunes that you can transfer onto your portable devices. 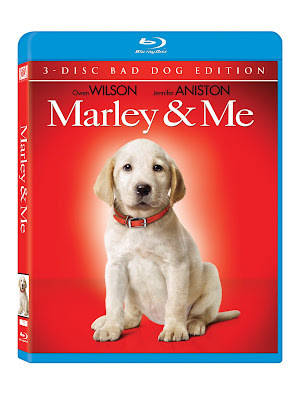 Filled with dog-friendly featurettes that introduce us to the some of the major canine actors hired as part of the twenty-two American Yellow Field Lab tall, lanky dogs who portray Marley from five weeks to fourteen years headed up by the distinct personality type opposites Clyde and Jonah as just two cast in the group of three to four for any given age. Going against the popular belief that you shouldn’t work with pets and kids (especially in the same film), the cast and crew—along with John and Jenny Grogan who are also interviewed in various featurettes—discuss the joys and challenges of working with these tremendously trained dogs. In displaying this, we're once again treated to one of the movie's best sequences as their skills were given the ultimate showcase in one of the film’s most effective montages as Wilson’s John does a voice-over of various columns which deal with what’s going on in his life as they continually struggle to deal with Marley. Although he jokes that dogs are the easiest actors to work with since they’re never on the phone or in the trailer and are always professional, Frankel, Aniston, and Wilson marvel at the wonderful ability the trainers had to take perfectly trained, well-mannered dogs and on cue, turn them into unruly terrors as the cameras rolled. While I think the best way to appreciate the story of Marley is by taking in John Grogan’s book—those of you who were a bit squeamish to see this well-intentioned misfire in its theatrical release can be rest assured that although you will probably want to bring a pocket pack of Kleenex for the sad ending, you don’t need to worry that it’ll be one that’s going to require a trip with your dog to the local pet psychiatrist.